Spring has officially sprung. The season of baby lambs, tiny chicks, and beautiful blossoms is upon us and I, for one, am absolutely delighted. As well as bringing us plenty to appreciate in the natural world, spring can also be a fantastic opportunity to engage in the tradition of good old spring cleaning. If, like me, you've been hooked on Marie Kondo's Tidying Up on Netflix, the new season has probably given you even more of an impetus to grab a mop and give your house the once over. But spring cleaning needn't be limited to your home. 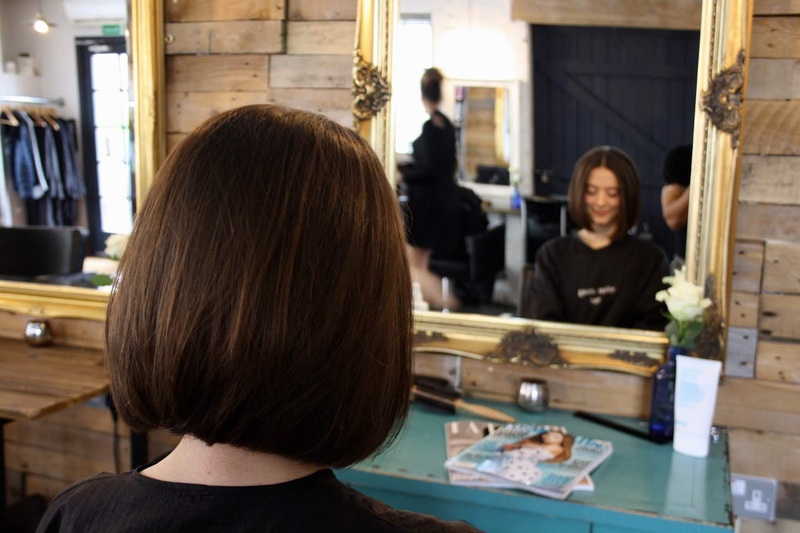 I recently took the chance to freshen up and enliven my look for spring at Gavin Taylor Hair in Rothley, near Leicester. My locks underwent a true transformation under Gavin's expert hands and my new look has definitely put a spring in my step (teehee). Keep reading to find out why you should definitely pop along to the salon yourself! 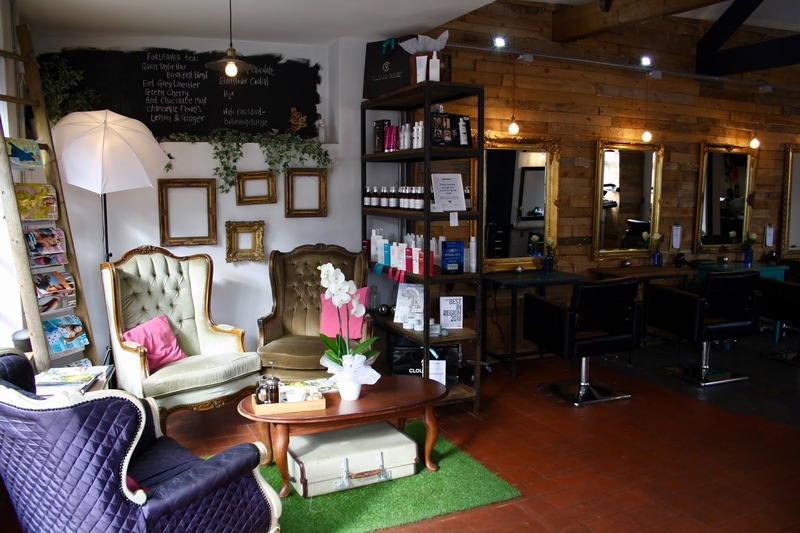 Gavin Taylor Hair is located in the charming village of Rothley, about a 30 minute drive from Leicester city centre. The salon is set in a rustic barn, converted from its former use as office facilities by Gavin himself in 2014. The charming feel of the countryside setting is retained in the decor: wooden pallets covering the walls, the exposed beams in the ceiling, and astroturf rugs in the reception area gave the place a really quirky touch. However, the quaint look to the salon didn't make it feel any less high end. Huge, vintage inspired gold mirrors sat in front of every chair, providing a refined and sophisticated vibe. The energy in the salon was also very relaxed and positive; it was quiet when I arrived for my appointment but it grew much busier over the course of my visit. Nevertheless, a chilled atmosphere remained throughout as the space was very well laid out. I never felt crowded by the stylists working with other clients and my 2 hour visit flew over! Another thing that kept me relaxed during my visit was knowing that my car was parked safely. Unlike many other salons in the locality, Gavin Taylor Hair has its own private car park meaning that there was no need to dash out and renew a parking ticket mid-treatment! You certainly couldn't fault the welcome at Gavin Taylor Hair. I was made to feel very much at home as soon as I walked into the salon. I was greeted by a couple of friendly stylists and offered a drink from the extensive menu, on which I was delighted to spot coffee from a local Leicestershire business, St Martins Coffee Roasters. To see independent businesses supporting each other in this way is fantastic and I really think that other salons should take note. Before my appointment began, I was invited to enjoy my coffee in the small but perfectly formed waiting area at the front of the salon. I actually hesitate to use the term "waiting area" to describe this space because it was such a cosy and homely environment. With its quilted vintage lounge chairs and cute decorative touches such as the suitcase under the coffee table and the old ladder used as a magazine rack, it felt more like someone's actual living room! Far from the cramped, clinical spaces that you often find at the hairdressers, this was a really refreshing change. My consultation with Gavin began with a simple question: "What do and don't you like about your hair right now?" I really liked this approach as I felt that it gave Gavin the chance to get to know me a little better and decide upon a style that would work well for me. I still wasn't sure exactly what I wanted to go for when I sat down in Gavin's chair. I had changed my mind about 3692897245 times before my appointment; I used to have very short, chin-length hair and I kept it that way for 5 years, but having grown it out more recently, I wasn't sure if I was ready to go for the full chop again. Thankfully, my indecision didn't ruin my appointment because Gavin was there to help. He went above and beyond the service I'd usually expect at a hairdressers - he had taken the time to study a few of my Instagram photos prior to my visit and put some thought into what kind of cut and style might work for me before I even stepped into the salon. This was a really pleasant surprise! Adding layers underneath, instead of on top, to keep the hair looking sleek even as it grows out. I was more than happy to follow Gavin's expert recommendations. Having honed his craft at Toni and Guy, Gavin specialises in cutting hair. While his salon does offer colouring with his other stylists, Gavin works exclusively on hair cuts, which made me feel that I was in the perfect hands! 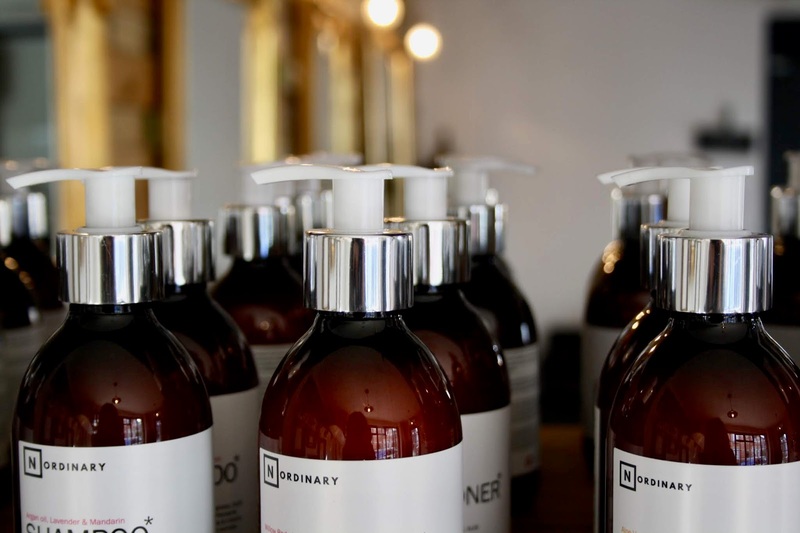 It's not every day that you can visit a salon which uses its own range of products made in-house. But this is exactly the experience that you get at Gavin Taylor Hair. Gavin's journey to making his own range began 15 years ago when he struggled to find products that he could use without causing his allergies to flare up. He found that even washing powder chemicals aggravated his allergies and that although he was using products marketed as "natural", they didn't help. This is because for products to be legally labelled "natural", they only need to contain a paltry 10% natural ingredients! I was really shocked to find this out. By contrast, Gavin's range, named No Ordinary in reference to the fact that they buck the trend, contain 99% natural ingredients, a massive improvement. 76% of those ingredients are also organic and all of his products are cruelty free and vegan. What also really impressed me was learning that Gavin uses the range himself at home, meaning that you genuinely know that he believes in them. I was treated to a wash with the No Ordinary Repair Shampoo, containing aloe vera, rosemary and bergamot, which Gavin recommended as my hair was looking a little dry. While it doesn't foam up as much as your standard shampoo, the No Ordinary range is designed to work in unison with your hair to naturally improve its condition. Once my hair had enjoyed a wash with Gavin's No Ordinary range, it was time for a deep conditioning treatment using Evo's The Great Hydrator Moisture Masque. I had never previously experienced a deep conditioning at a salon so I was very excited to begin! The first step was to apply the moisture masque product to my hair and scalp. This involved a gorgeous, thorough massage which made the experience oh-so luxurious. No part of the treatment was rushed and being able to enjoy a massage whilst the product worked its magic on my locks was a huge bonus. Once the product had been worked into my scalp, my hair was wrapped up with the masque still in place and I was sat under a climazone (a sort of heat lamp for the uninitiated!). Then, I was left to enjoy the rest of my coffee and a glossy magazine for 10-15 minutes. Gavin told me that this heat treatment really enhances the efficacy of the masque. The heat supposedly opens up the cuticle of the hair, enabling it to take in more of the moisturising product. Genius! Once I had basked in the glow of the climazone for the required time, the masque was rinsed away and my haircut began. Before the big reveal of my new 'do, it is worth saying a few words about the amazing eco-friendly approach at Gavin's salon. Now I know what you're thinking, the environment probably isn't the first thing that springs to mind when you think about getting your hair cut, but Gavin Taylor Hair is working to change that. Gavin and his team put a huge amount of effort into ensuring that their business is run as ethically and sustainably as possible. Gavin Taylor Hair has been awarded nationally accredited plastic free status, meaning that no single use plastics (aside from those which are recyclable) step foot into the salon. Gavin invites customers purchasing products from his No Ordinary range to bring in their containers when empty, offering to refill them and provide a discount on repeat purchases. Even Gavin's business cards make a difference - they are manufactured from recycled t-shirts! Environmental awareness really is at the heart of the business. Gavin's sustainable outreach even extends into the local community. People in the village of Rothley bring their empty crisp packets into the salon for Gavin to ship them to Walkers for recycling. The work carried out at the salon is truly inspiring and provides a model that far more businesses should follow. Aaaaand finally, it is my pleasure to introduce my new hair! As you'll be able to see from my before and after photos below, Gavin's transformation made a huge difference to the look and feel of my hair! The new, sleek cut is very sophisticated yet easy to maintain and the restorative conditioning treatment, combined with the powers of Gavin's No Ordinary shampoo had my hair looking and feeling softer and healthier. Getting a chop has really boosted my confidence going in to a new season and I couldn't recommend visiting Gavin Taylor Hair highly enough if you're looking for a springtime boost. Gavin, his wife Jane, and the whole salon team were an absolute delight: so friendly and positive. The service was second to none and truly enhanced my experience. 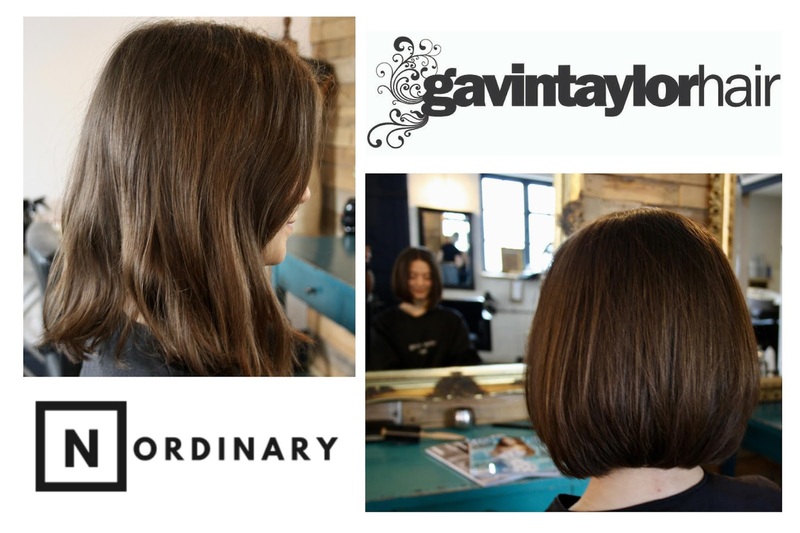 * My treatments at Gavin Taylor Hair were complimentary, in exchange for a blog post review.